My friend and I decided to have dinner here afew days ago. It’s brightly lit with a typical western restaurant decor. The restaurant doesn’t have alot of tables when their “private room” is booked. My friend and I sat at the bar which gave us a direct view of the variety of brews offered and the 2 TVs broadcasting the playoff games. I got El Diablo mussels ($20), a flight of beer ($6) and dragon stout & skor ice cream ($6). The El Diablo mussels are mussels that are steamed in an abbey blonde beer broth with slices of chorizo sausages, cilantro, tomatoes, smoked paprika and a large dollop of crème fraîche. It comes with a loaf of Cantillon Sourdough bread to help soak up all the sauce. 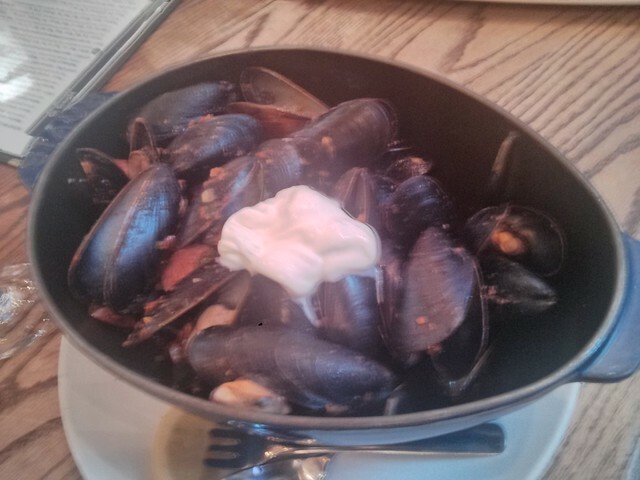 It has a nice hint of spiciness and it was quite a large portion of mussels. The portion size is perfectly filling to eat for dinner on its own compared to other mussel offerings at the other restaurants that I’ve tried. I got Samuel Adams Cold Snap, Rodenbach Grand Cru and the Shillow Beer Co. Sass on the Side for my beer flight. The bartender recommended that I drink it in the following order: Samuel Adams Cold Snap, Shillow Beer Co. Sass on the Side and finally the Rodenbach Grand Cru. The Samuel Adams Cold Snap is a light-bodied wheat beer with hints of plum, orange peel, coriander and hibiscus. It tastes like a lager and it goes down well. It has an alcohol level of 5.3%. The Shillow Beer Co. Sass on the Side is a brown ale that’s bitter. It’s pretty good but I prefer my beer to be less bitter. It has an alcohol level of 5.6%. The Rodenbach Grand Cru is sweet and sour and very wine-like. While at times it was abit too sour tasting, it is a nice wine beer. It has an alcohol level of 6%. 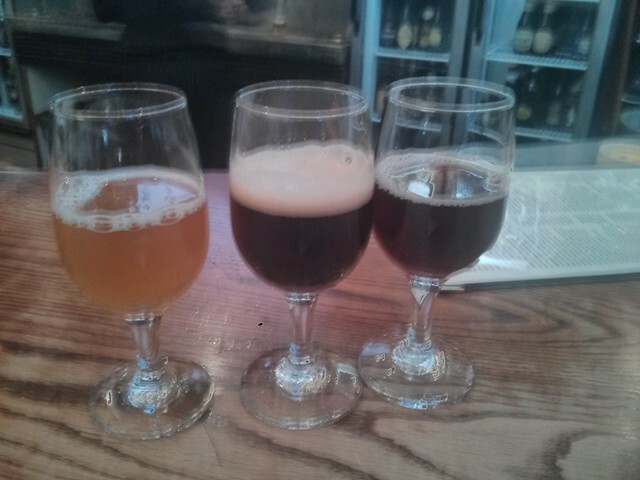 Of the three beers I tried, I like the Cold Snap the best followed by Rodenbach Grand Cru. The dragon stout & skor ice cream was quite chocolatey however it tasted similar to the sound of their cookies ‘n cream and chocolate stout ice cream. x.o. 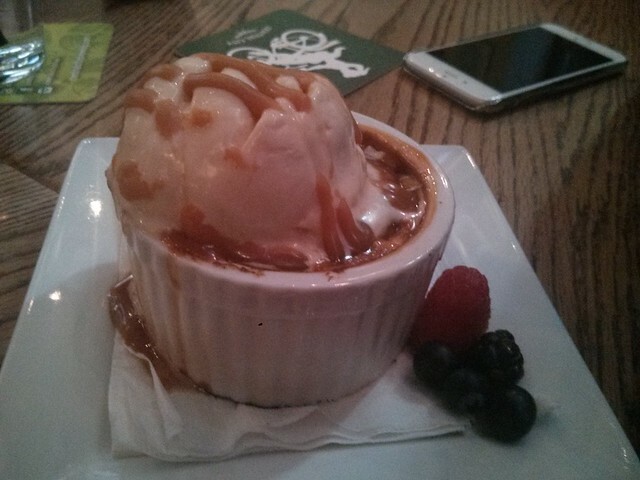 caramel sauce and it’s topped with vanilla bourbon ice cream. She really enjoyed it. The next time I come back, I would try the Belgian fries, tiramisu and a different selection of craft beer. My friends and I came here for take out lunch after looking at the sakura blossoms in High Park and walking around Dundas & Queen West. Two of my friends got the lobster roll ($15.76 including tax) and ate it on the TTC and thoroughly enjoyed it. The lobster roll comes with fries and broccoli house slaw. It’s lobster meat with celery and chives between a slice of toast. 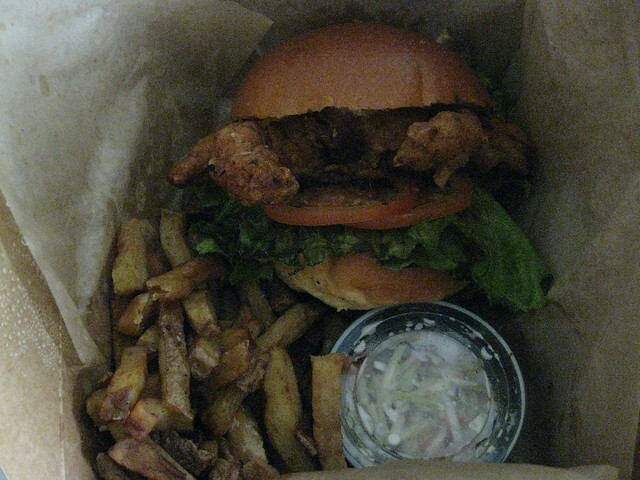 Another friend and I got the soft shell crab sandwich ($18.02 including tax). 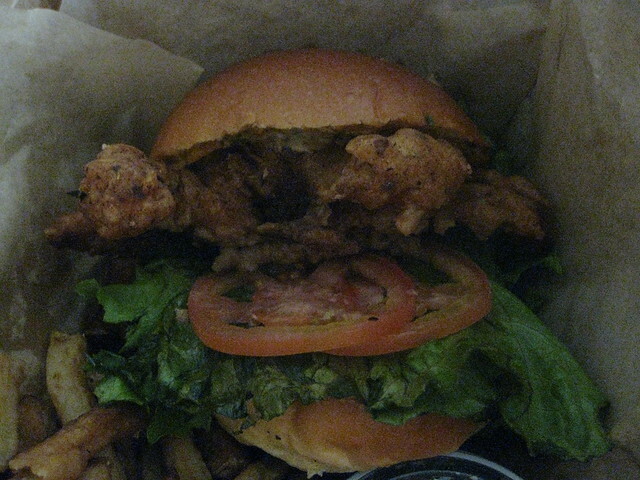 The soft shell crab sandwich is battered deep fried soft shell crab on 2 slices of tomatoes and a lettuce leaf between a brioche bun. It comes with fries and coleslaw. It was quite tasty. For my birthday celebration I made reservations for a friend and I at R&D because I really wanted to try this restaurant, not because of Masterchef but because the co-owner is Alvin Leung, a three Michelin star Chinese Canadian chef. 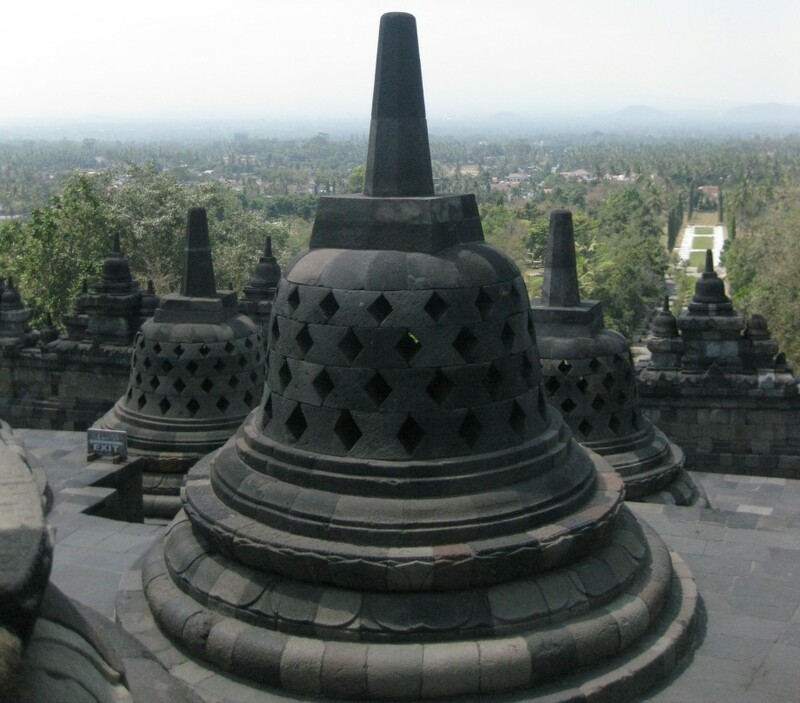 The decor is quite modern with comfortable and spacious seating and a bright interior. Our server informed us that the skewers were unavailable. We ordered the general sanders’ chicken ($25) and the 76 hour peking duck ($68). 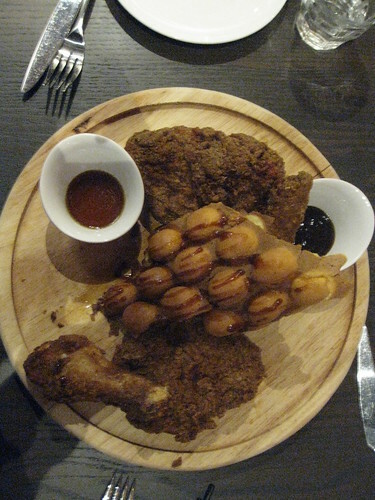 The general sanders’ chicken is comprised of 2 deep fried crispy chicken legs, 2 deep fried crispy chicken breasts, Hong Kong egg waffles, sichuan maple syrup dipping sauce and kung pao dipping sauce. To make the batter coating the chicken prior to deep frying, vodka rather than buttermilk is used as the primary binder. Both the leg and breast were very tasty. I was pleasantly surprised that there are organs with the breast since it’s deep fried with the spine and bones as well. The dipping sauces go well with the chicken however my favourite is the sichuan maple syrup. The egg waffles are crunchy and sweet and the maple syrup goes really well with it. Overall, it’s a nice Asian inspired chicken and waffles dish. The peking duck takes 76 hours of prep and cook time. The duck is first soaked in a salt brine for 40+ hours, then slow cooked for several hours and finally oven roasted. 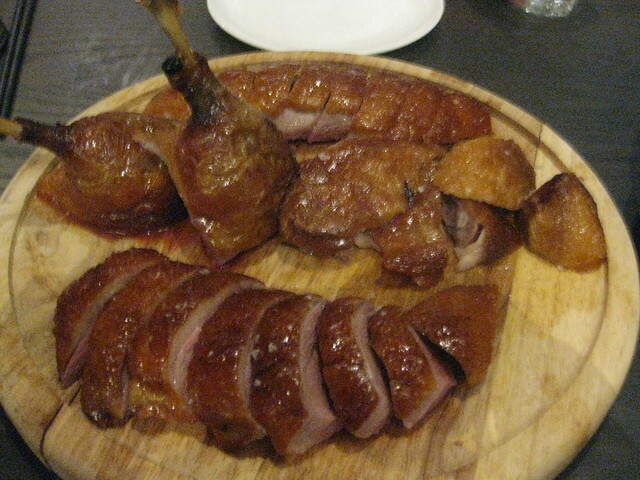 The peking duck served at R&D is an interesting spin on the dish. 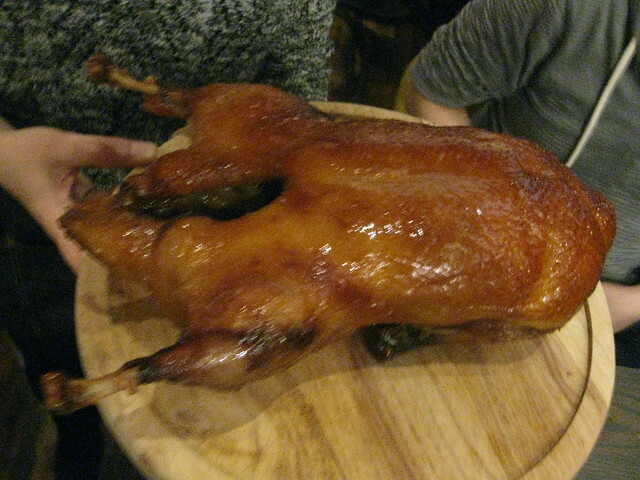 The skin isn’t as crispy compared to a traditional peking duck while the slices of meat are very thick. The meat is very tender and soft however it comes with a very large layer of fat between the skin and meat. The steamed buns are nice albeit abit thick in comparison to the normal paper-thin wraps at most other restaurants. 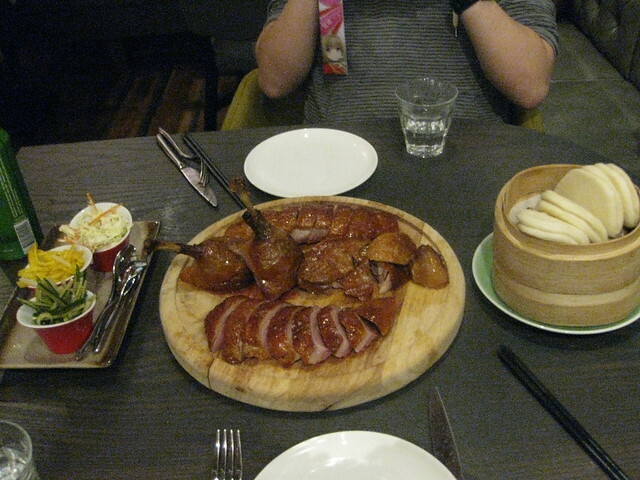 There are 3 different coleslaws to accompany the thick slices of duck and the thick skinned steamed buns. There’s cucumber with hoisin sauce and scallions which is a fairly Asian take on coleslaw. There’s mango with asian pear and plum which is a very fruity take on coleslaw. There is also cabbage, ginger and carrot which is most reminiscent of regular western coleslaw. Of the 3 slaws, my favourite is the asian pear, mango and plum followed by the cucumber, hoisin sauce and scallion. My friend enjoyed this dish the most. The service at R&D is nice although perhaps more training is required for their staff. We were unable to finish the peking duck so I asked for containers. The servers said that they’ll wrap up my food for me which is nice of them to do so. When I opened up the take out box a day later I was surprised to find only 30% of the leftovers in the box. My friend and I only had afew bites of the platter and I was looking forward to my duck leg so imagine my disappointment when there wasn’t any duck leg in my container and there were only afew pieces of duck and afew pieces of the steamed buns. All three coleslaws were missing from my container as well. I was very disappointed since I was looking forward to eating the dish again (albeit it wouldn’t have been as tasty as when it’s fresh out of the kitchen). Although my birthday dinner was good the day of, the care of my leftovers tarnished the restaurant for me. 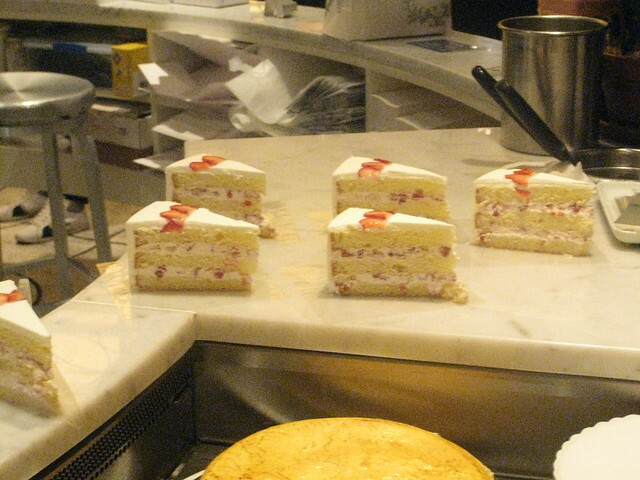 I went to the Plaza Food Hall boutique to try mille feuille. The selection at the Plaza Food Hall compared to the menu online is only a fraction of the offerings. Originally I had wanted to try afew of the following: green tea mille crepe, citron/lemon mille crepe, coconut mille crepe, chocolate banana mille crepe and the marron/chestnut mille crepe. 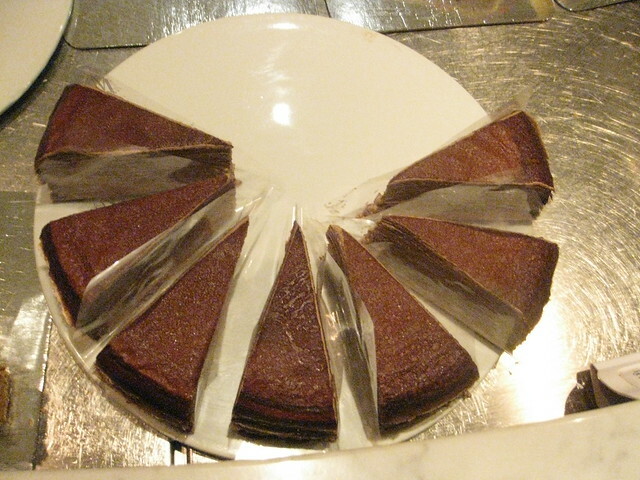 The chocolate banana mille crepe is only available at the Plaza Food Hall location. 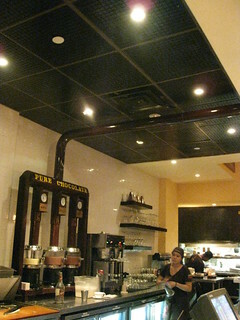 The selection at the Plaza Food Hall when I was lining up consisted of the following: original mille crepe, green tea mille crepe, chocolate banana mille crepe, strawberry mille crepe, checkers, flourless chocolate cake, chocolate cake, chestnut cake, mimosa, strawberry shortcake and cheesecake. 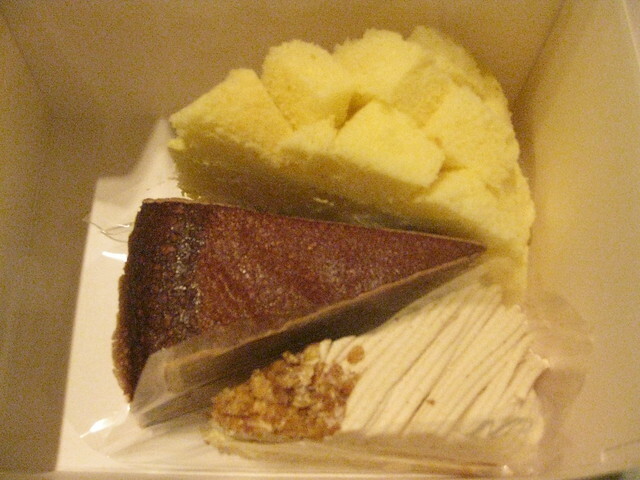 While I was lining up in the early afternoon, they ran out of green tea mille crepe cake. 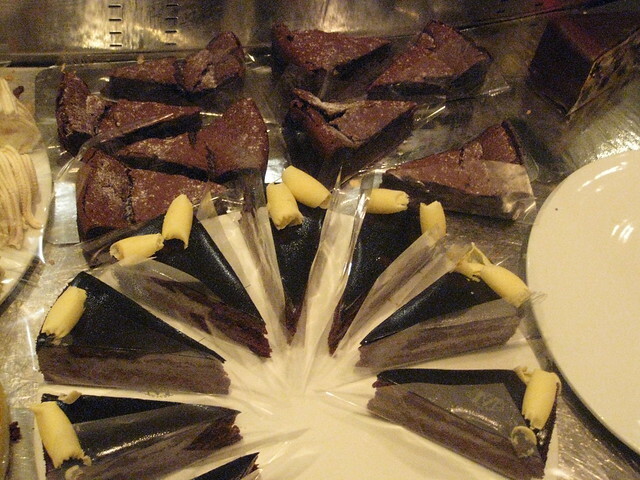 Each slice of cake is $8 USD. I got the chocolate banana mille crepe, chestnut cake and mimosa. I had initially thought that the chestnut cake was the chestnut mille crepe. 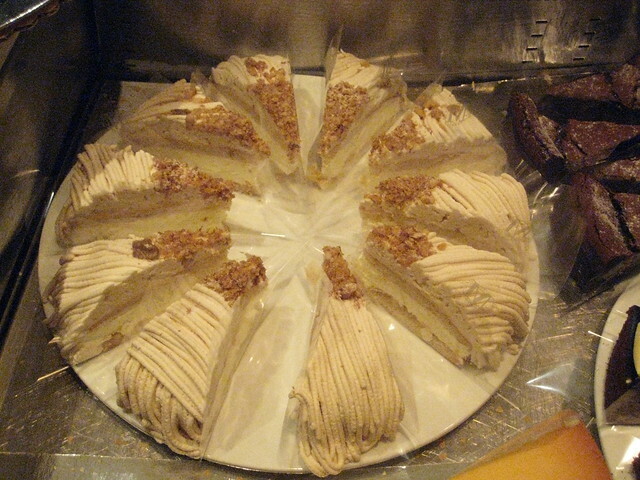 The signs for the cakes at Lady M are in a way misleading since it only states the flavour such as marron, cheese, etc. rather than specifying whether it’s a cake or a mille crepe as well. The chestnut cake is an almond flour cake covered in chestnut-infused cream with a whipped cream center and topped with roasted walnuts and snow sugar. It was good even though it wasn’t what I thought I ordered. The chestnut mille crepe that I would have preferred to try is layers of crepes with chestnut-infused pastry cream in between the crepes and topped with powdered sugar. The chocolate banana mille crepe is layers of chocolate lacy edged crepes with banana-infused pastry cream in between the crepes. It was good although it was abit hard to cut into bite sized pieces with only a fork. 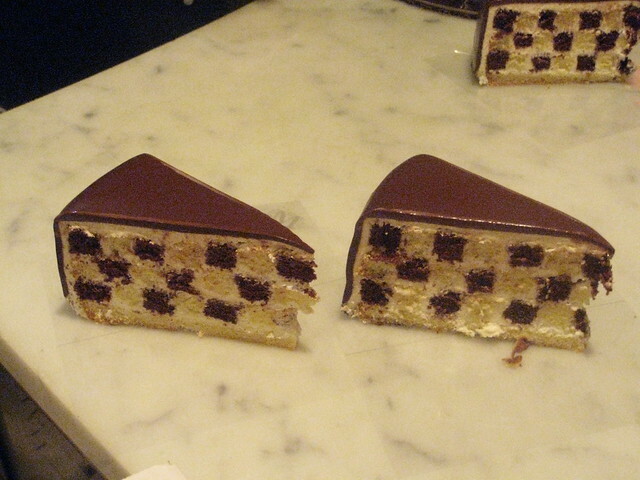 I got the slice of Mimosa cake as a lark because of how pretty it looked in the display case. 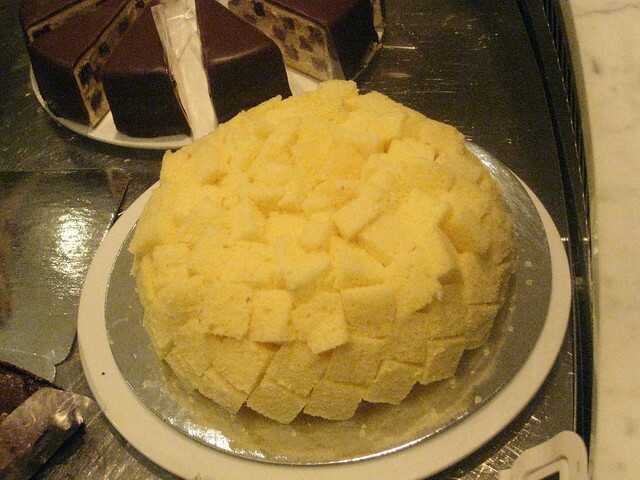 It’s a vanilla sponge cake with the top and edges comprised of cubes and filled with vanilla custard. 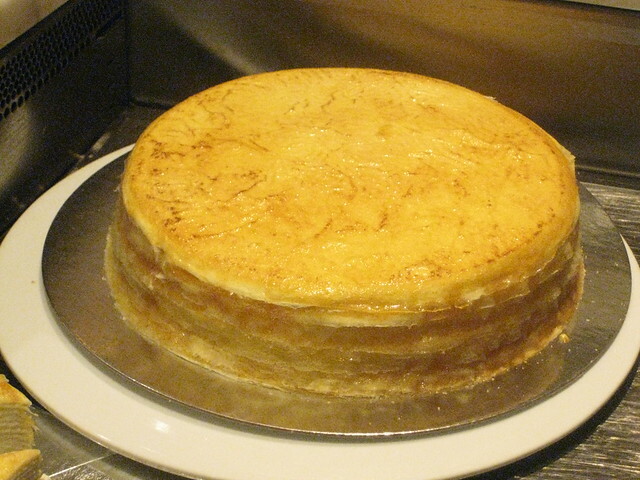 The custard was delicious and overall it was a tasty sponge cake. 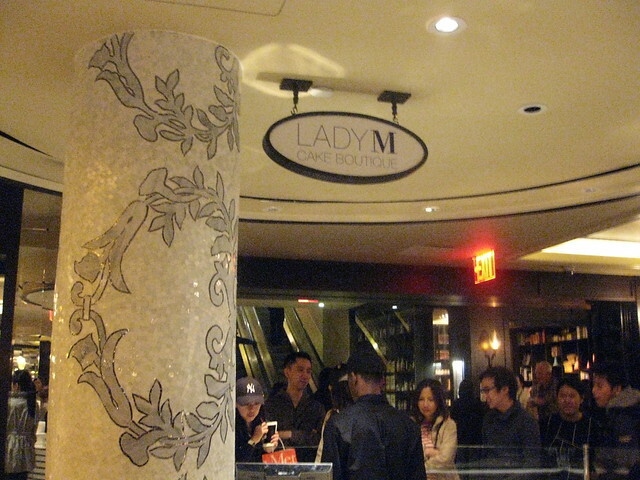 If you’re a fan of mille crepes, cakes and dessert then you should try Lady M.
The last time I came to NYC, I didn’t have the time or patience to wait at least 2 hours for dinner so I was hoping that this time around I could try Takashi. My Montreal foodie friend had recommended this restaurant to me. I didn’t make reservations at this restaurant because they don’t allow reservations under 4 people. I arrived at the restaurant after 5:30pm (their opening time is 5:30pm) and was told that the wait is about 1.5 hours. I put my name down on the list and did a brief tour of Greenwich Village while I waited. I’m guessing that I should arrive between 5-5:20pm in order to be able to be potentially seated at 5:30pm if I come again without reservations. The servers here are very nice and knowledgeable. 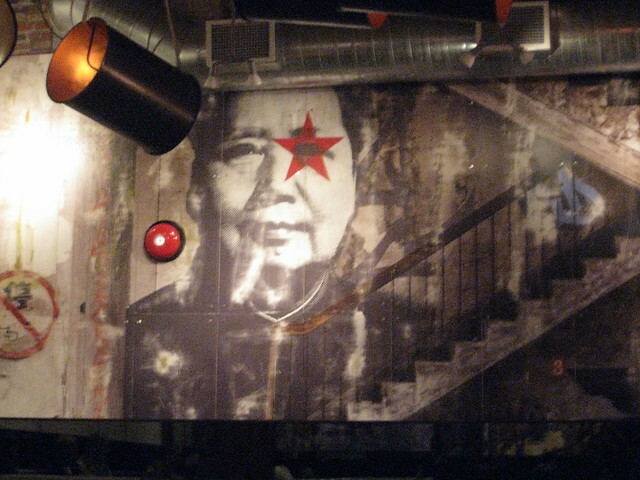 The decor itself is very rustic and modern simultaneously with splashes of Japanese artwork. The lighting is abit dark. I was seated at the bar which seats 3 couples as denoted by a grill and a bench for two. Takashi can be an adventure on the wilder side of food. I decided to try some of their limited availability items and some of their more adventurous offerings. 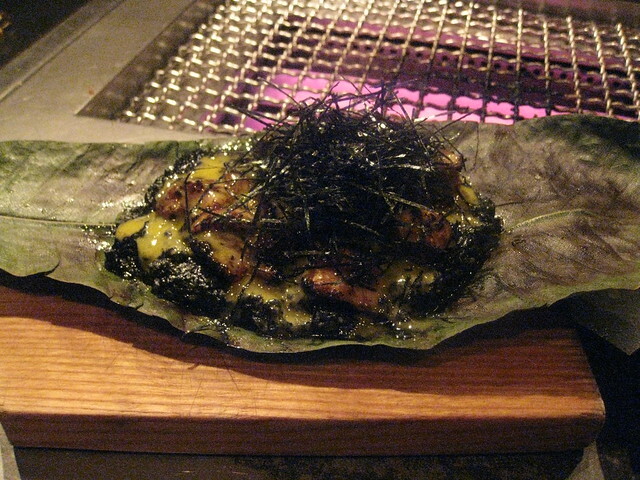 I got the Namagimo ($16 USD + tax), Testicargot ($12 USD + tax), grilled hatsu/heart ($14 USD + tax) and miso-marinated sweetbread on squid ink rice ($20 USD + tax). 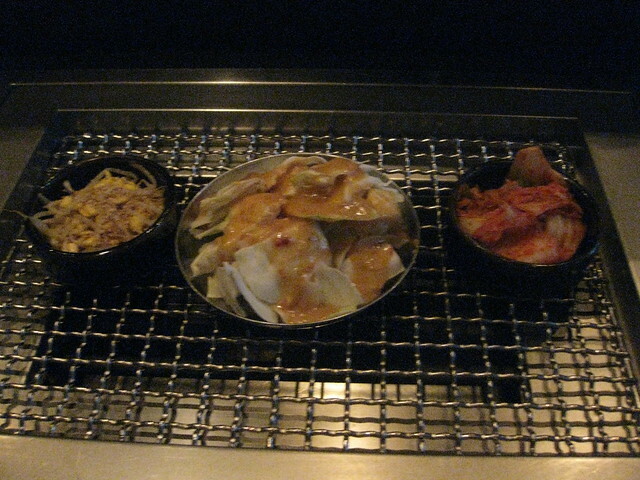 Takashi serves 3 complimentary side dishes which are kimchi, beansprouts dusted with sesame seeds and cabbage which provide the vegetables for an otherwise meat focused menu. The complimentary sides were good and well-seasoned. Namagimo is a limited availability item and I was lucky to be able to get it. This dish is a cold appetizer. 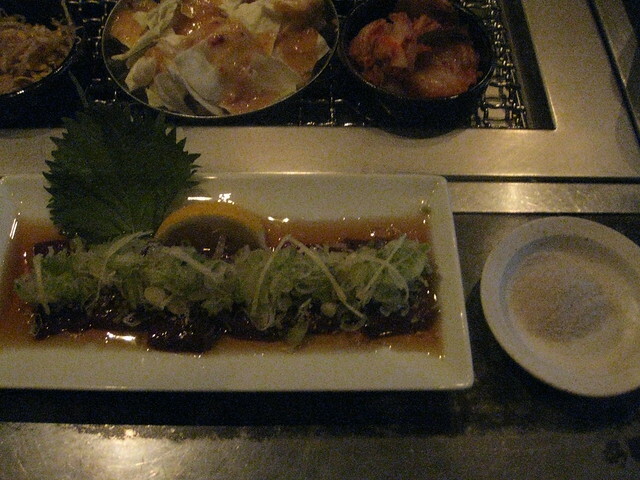 It is raw liver topped with green onions and scallions on sesame oil and garnished with a lemon wedge and a shiso leaf. It comes with roasted rock salt on the side. I was advised to liberally squirt the lemon juice all over the dish. I found it abit hard to pick up the liver with the toppings on top so I used my chopsticks to sprinkle the salt on top of the meat before eating it. Although the liver is abit tough, it was a delicious combination. 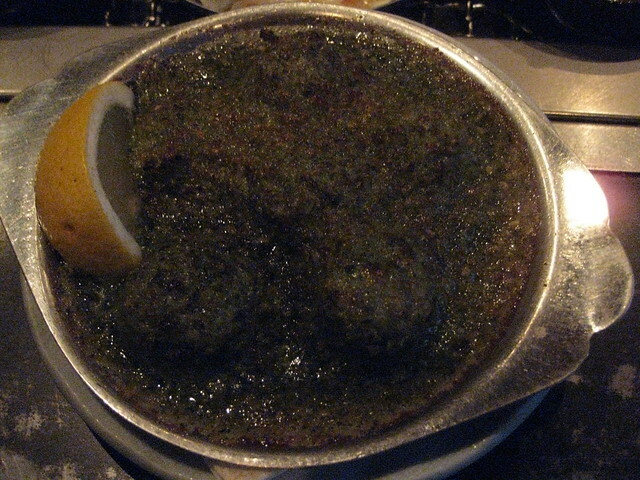 Testicargot is cow balls done in an escargot style with garlic shiso butter and garnished with a lemon wedge. Once again I was advised to liberally apply lemon juice to the dish. The garlic shiso butter reminded me strongly of pesto and tasted like pesto. The escargot style cow balls are reminded me of takoyaki but without the batter. If you’re adventurous, I recommend trying this dish. 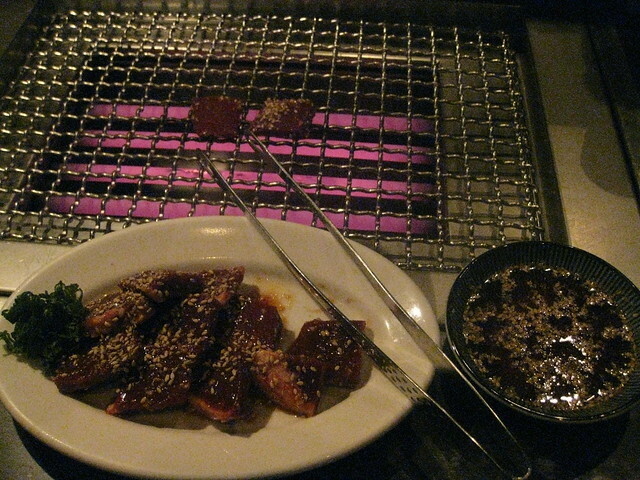 Grilled hatsu/heart meat is a limited availability item. The hatsu/heart meat are served raw and sliced with a side of Takashi’s sesame sauce and green onions. You grill the meat in front of you. It was tasty. 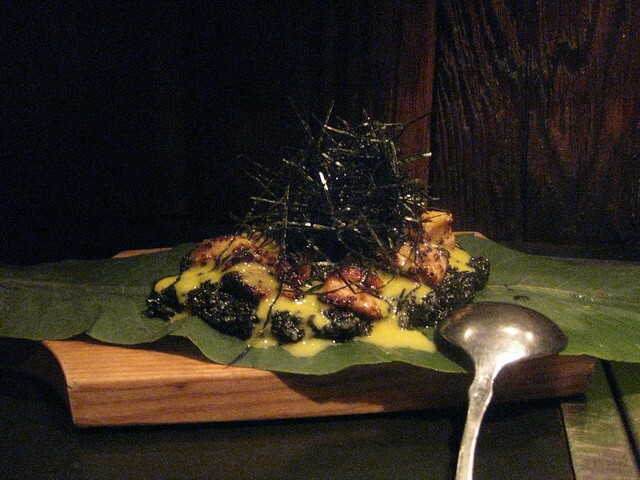 The miso marinated sweetbreads on squid ink rice with spicy yuzu saffron aioli and shredded seaweed that’s served on a magnolia leaf is interesting. The entire concoction is grilled in front of you until it bubbles for a bit before being expertly pulled back on to the wooden serving board. The spicy yuzu aioli wasn’t spicy. The squid ink rice was tasty albeit I was expecting a larger portion of it. Originally I thought that the sweetbread would be a kind of sweet bread. Sweetbread is actually the throat or pancreas of a cow or calf. Since the offal is suppose to be marinated in miso, I thought it would be salty, it was however quite sweet. I tried a tiny piece of the magnolia leaf for curiosity’s sake and it was chewy and slightly tasteless since it borrows the taste from the squid ink rice and aioli. The next time I come I want to try Calf’s Brain Cream in a tube with Blinis & Caviar, grilled stomachs, grilled tongue experience, niku-uni, amongst other dishes. I had watched the Food Network Valentine special called Outrageous Chocolate. 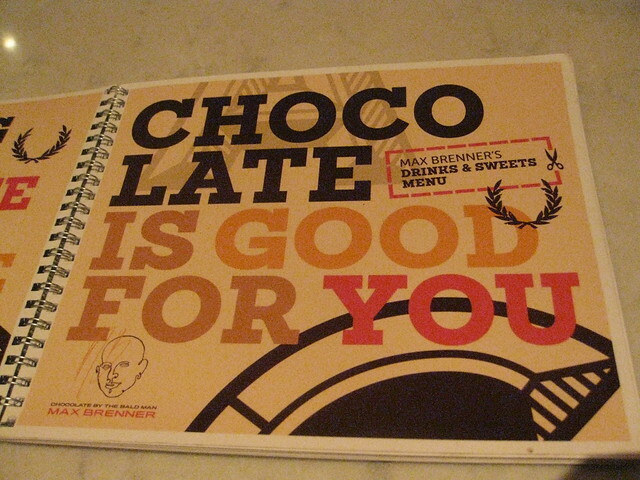 It featured Max Brenner and I was interested in trying their chocolate pasta and chocolate pizza. 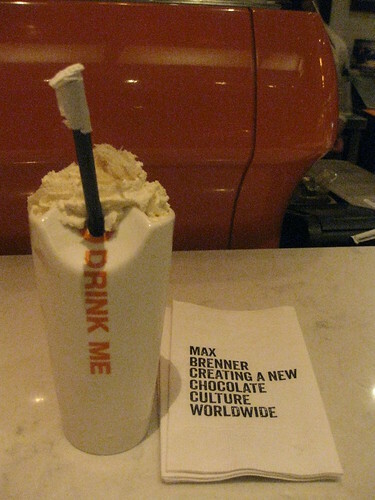 I went to Max Brenner for dinner after watching the Spring Spectacular. It’s easier to sit at the bar rather than getting a table. Unfortunately when I sat down at the bar and looked at the menu, I realized that the chocolate pasta was no more since it was a winter special and they started their spring special. 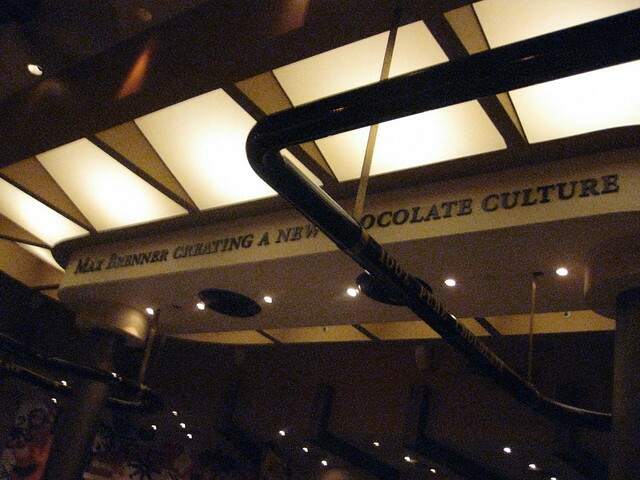 It seems like chocolate pasta and I aren’t fated since I went to MoRoCo Chocolat to try their chocolate pasta on their Summerlicious 2014 menu and that was also a bust. In the end, I ordered the works half-sized chocolate chunks pizza ($9.95 USD + tax) and the halva milkshake ($7.95 USD + tax). 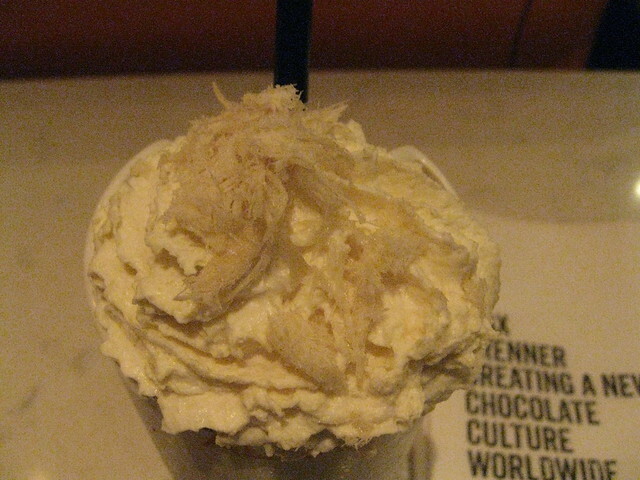 The halva milkshake came first. The halva milkshake is a creamy sesame seed tahini paste that’s blended with honey, vanilla ice cream, toffee and milk chocolate ganache and topped with whipped cream and shaved coconut. It was definitely a creamy sesame tahini taste. The coconut compliments it. It’s served in an Alice in Wonderland cup and it’s a sweet, whimsical concoction. The works half-sized chocolate chunk pizza didn’t live up to my expectations. It’s comprised of melted milk and white chocolate chunks with marshmallows, bananas, melted peanut butter and hazelnut bits. The marshmallows could have been toasted and roasted and at the very least, have some that are melted on the pizza to create a melted mozzarella cheese effect. 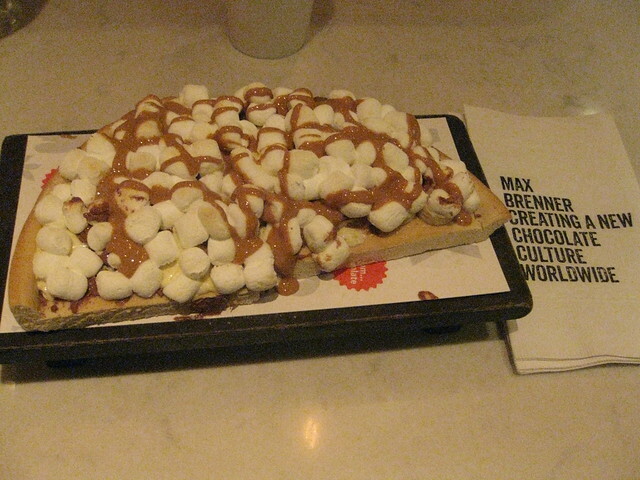 Instead it looked and tasted like marshmallows were liberally sprinkled on top of the pizza before it was served. I didn’t taste any of the hazelnut bits. The chocolate chunks themselves were just drizzles. There weren’t any chunks of chocolate on the pizza. The pizza crust itself was like a deep dish pizza crust and it was extremely doughy. I would have preferred a thin crust pizza. 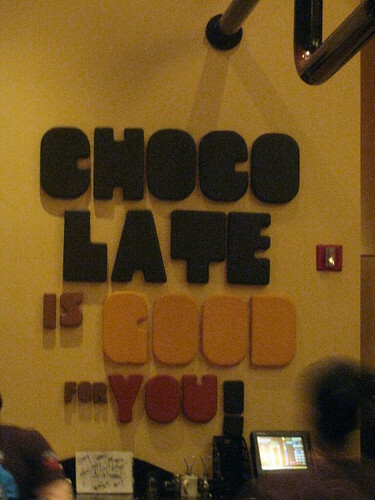 Overall, I don’t recommend getting a chocolate pizza here. My friend and I came here for brunch, lunch and dinner. We went to both the Battery Park City location and the Theatre location. I only realized on Boxing day that our hotel, Row NYC was diagonally across from Shake Shack while finding the Battery Park City location was an interesting adventure in downtown NYC. I first got their Shack Burger and the Peanut Butter Shake (total is $11). 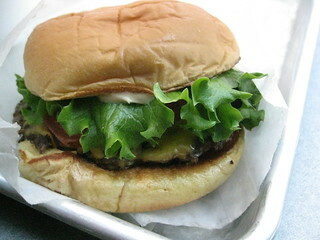 The Shack Burger is a cheeseburger with tomato, lettuce and their Shack sauce. For such a small size, it’s tasty. 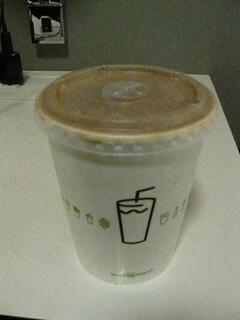 The peanut butter shake was very thick and tasted exactly like peanut butter that’s been put into a milkshake form. It was delicious. 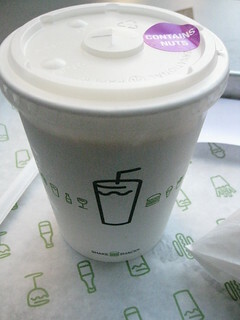 It’s very conscientious of Shake Shack to put a ‘contains nuts’ sticker on my peanut butter shake. I tried their Smoke Burger and Chocolate Shake for dinner (total is $12.63). The Smoke shack is a cheeseburger with applewood smoked bacon, chopped cherry peppers and their Shack sauce. It’s a bit spicy. 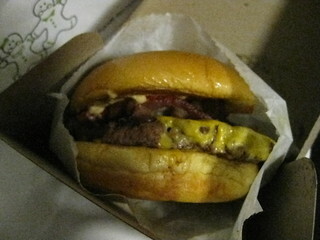 I prefer the Smoke Shack over the Shack burger which probably makes sense for the $1.50 price difference. The Chocolate shake is a very tasty chocolate milkshake albeit it’s not as thick as the one I had at the Battery Park City location. 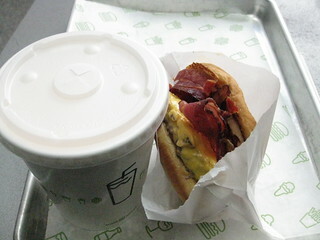 I got their Smoke Burger and Strawberry Shake for brunch (total is $12.63). The Strawberry shake is an ok strawberry milkshake and it’s definitely not as thick as the one at the Battery Park City location. The strawberry shake is thicker than the chocolate shake at the Theatre location. I went to the Battery Park location for brunch on Easter Saturday around 12pm. The line up was quite short surprisingly since I was expecting to wait awhile like last time. Getting a table on the other hand is nigh impossible. I got the Smoke burger and Strawberry Shake (total is $13). The price increased abit from Christmas 2014 to Spring 2015. Other than the price increase, the Smoke burger is just as good as before while the strawberry shake is abit thicker than the one at the Theatre location. My friend and I came here for a late dinner. Initially we wanted to come here for lunch but the line up was quite long. Ellen’s Stardust Diner is on Broadway and 51st Street near Rockefeller Center. My friend had recommended this diner to me because of my interest in Broadway shows. The servers here serenade you with Broadway songs, pop songs and country or blues songs accompanied by a harmonica while you wait for your table, decide on your order, wait for your food and eat your food. 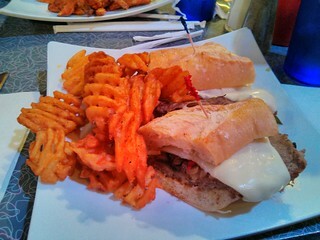 I got their Philly Cheese-steak Sandwich with waffles fries. 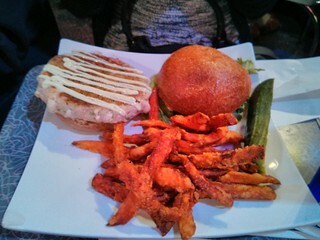 My friend got their ahi tuna burger. The Philly Cheese-steak sandwich consists of sautéed onions, mushrooms, peppers, steak slices and melted mozzarella cheese with waffle fries and a slice of pickles on the side. It was very tasty. The Ahi Tuna burger is a ginger miso glazed tuna patty with wasabi mayo drizzled on top with lettuce betweeen a brioche bun. It’s accompanied with a side of sweet potato fries and a slice of pickles. My friend enjoyed it. Overall, if you’re interested in Broadway shows and being serenaded while you dine then check out this diner in NYC. My friend and I came here for lunch. It’s our first time eating at a T.G.I. Friday’s. I got the spicy craft beer cheese burger ($24) while my friend got the sizzling chicken and cheese. The spicy craft beer cheese burger is a regular beef patty burger with jalapeños, breaded fried jalapeños, chipotle mayo, lettuce, tomatoes, guacamole and craft beer-cheese sauce. It comes with a side of fries. I had initially expected my burger to be spicy with the 2 types of jalapeños however it wasn’t spicy so I was abit disappointed by that. 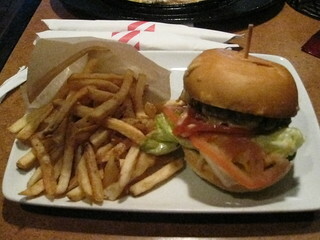 Other than that, it was a tasty burger. 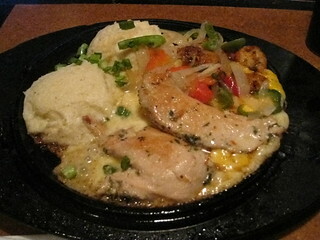 The sizzling chicken and cheese is a garlic marinated chicken breast with onions, peppers, mashed potatoes and melted cheese. My friend enjoyed it. After dinner at Borealia, my friends and I decided to get dessert at Bang Bang. One friend had the half ice cream sandwich ($4.40 + tax) while I got the ice cream puff ($5 + tax) and my other friend had the Hong Kong waffle ($8 + tax). 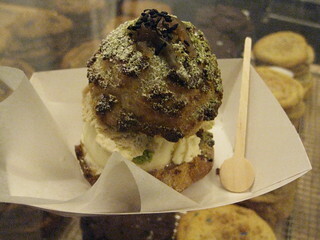 I got the matcha chestnut cream puff with chestnut and matcha drizzle ice cream and ginger milk ice cream. It was a heavenly combination although at times the intensity of the ginger milk ice cream overwhelmed the matcha chestnut ice cream puff. 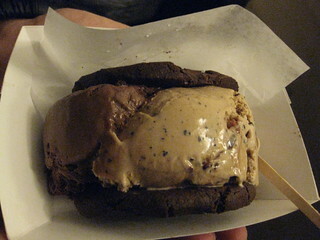 My friend got the rocky road kill and mofo fudge ice cream sandwiched between a rococoa cookie. The RoCocoa cookie is made with maldon salt, cocoa brut and 70% callebaut chocolate. It looked like chocolate heaven to me. 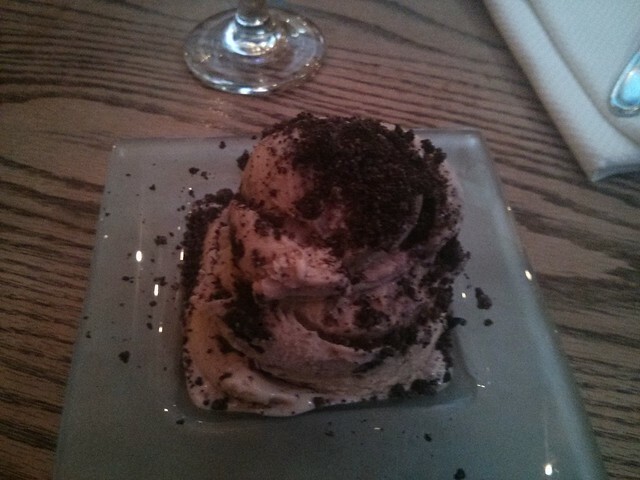 My friend liked the rocky road kill ice cream more than the mocha fudge ice cream. 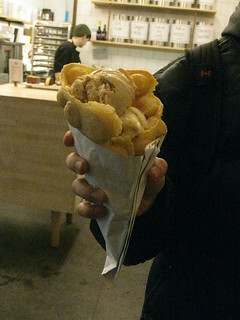 My other friend got the London fog and burnt toffee ice cream in a Hong Kong waffle. He liked the London fog and burnt toffee ice cream combination. My friend prefers the ice cream sandwich over the ice cream waffle crepe. 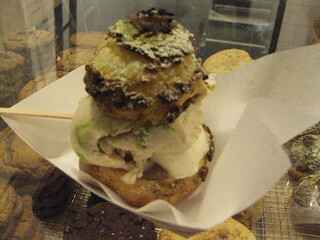 Similar to Kekou Gelato, they have a loyalty card wherein if you get 10 stamps, you get a free half ice cream sandwich. You’ll need to request their loyalty card since they don’t ask if you have one when you pay for your order unlike at Kekou Gelato.